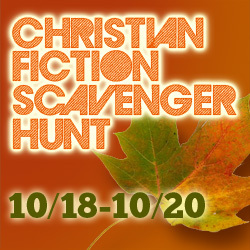 Welcome to the Christian Fiction Scavenger Hunt—fall edition! This time around, the hunt has 25 stops and runs from 10/18 (noon MDT)–10/20 (midnight MDT). It’s a great way to discover new books from some of your favorite authors (and maybe meet some new authors you haven’t yet heard of). The grand prize is an iPad Mini, plus two chances at a 25-book prize pack. AND some individual stops have an additional prize, so read each post carefully! There will be a red clue at the bottom of each post that you’ll need to write down, and that clue will guide you to the next stop. It’s best to begin the scavenger hunt at stop #1, Lisa Bergren’s site. Then after you’ve gone through all 25 stops and collected all the clues, fill out the Rafflecopter form on Lisa’s site. Be ready to provide the completed clue quote within 24 hours of email notification from Lisa, or another will be drawn randomly. No need to email or submit it unless you’re notified on 10/21. The contest is open internationally, so everyone is welcome to participate! Let’s get started! I’d like to welcome my friend and fellow Amish-fiction author Suzanne Woods Fisher to my blog today! Suzanne is an award-winning, bestselling author of Amish fiction and non-fiction. The Waiting was a finalist for a 2011 Christy Award, The Search won a 2012 Carol Award, The Choice was a finalist for a 2011 Carol Award. Amish Peace: Simple Wisdom for a Complicated World and Amish Proverbs: Words of Wisdom from the Simple Life were both finalists for the ECPA Book of the Year (2010, 2011). Find out more at her website or connect with her on Facebook, Twitter, and Pinterest. My grandmother, Marion Woods, was a bundle of high energy. After her five children were raised, she decided to start a tearoom on the sun porch of her large country home called Eagle Hill, on Buzzards Bay in Massachusetts. When my dad brought his future bride home to meet the family, my grandmother handed her a knife and a bowl of tomatoes and told her to start slicing. After all, the tearoom was booked with lunch reservations and Marion needed extra hands. My mother, who came from an oh-so-proper home, was appalled. My grandmother didn’t even blink. The tearoom was so well received that my grandmother decided to expand Eagle Hill and build cottages that surrounded the lake. She planned to rent out the cottages to vacationing families during the warmer months. In a rare moment of reflection, she decided to first visit with her friend, Ruke Wakefield, who ran the nearby Toll House Inn, also in Plymouth County, to glean some tips about inn keeping. At the time, Ruth called her creation “Toll House Crunch Cookies.” As the popularity of Toll House Crunch Cookies increased, sales of Nestle’s semi-sweet chocolate bars also spiked. Soon, Nestle started to sell chocolate chips as a product. Nestle and Ruth Wakefield came up with an agreement: Nestle would print the “Toll House Cookie” recipe on its package and Ruth would be given a lifetime supply of Nestle chocolate. The Toll House Cookie is still the most popular cookie in America. Talk about a woman’s influence! Back to the meeting between my grandmother and Ruth Wakefield. My grandmother left Ruth filled with encouragement and enthusiasm and ideas about how to expand Eagle Hill as an inn, which she promptly did. The 17-acre farm transitioned into a delightful, sought after destination. Fifty years later, I wrote a three-book series, starting with The Letters, about a strong, determined woman who started an inn called Eagle Hill. My grandmother passed away when I was very young, but her “can do” influence remained. It’s encouraging to realize your example as a parent or grandparent goes deep into your children’s development. Such awareness is a motivation, too, to be our best self at all times. Be it cookies or innkeeping, you have a lasting impact on the next generation. You can purchase Suzanne’s novel, The Letters, at Amazon, Barnes & Noble, CBD, or your local bookstore. Before you go, write down stop #12 clue: TO AMISH. Your next stop is Suzanne’s own blog! Make sure you make the rounds to all 25 stops and then enter the Rafflecopter form at stop #26 back at Lisa Bergren’s site to be in the running for all the big prizes! I’ll also be giving away FIVE sets of The Big Sky series! Use the widget below to enter! Thanks for the story about the first ever chocolate chip cookie. Very interesting. Thanks also for the hunt. My grandparents influenced me by spending some special time with my brother and I. They were not always able to do that, but with my 6 kids now I try to actively spend special time with each of them. My parents have been great influences in my life. They have always encouraged me to do my best in whatever I do, to always be kind to others, to work hard, and to value education. I don’t know where I would be without them! My grandparents have and are a big part of my life. They have always spent time with me and encouraged me to follow God and my dreams. Thank you for hosting. I love Amish fiction! I am loving this Scavenger Hunt! My grandparents helped me create memories, and I want to give that same opportunity to my children! How did my grandparents NOT influence me. I loved my grandparents and miss them more and more everyday. They are the reason why I love history so much. Thanks for being in the hunt! Would love to win some new books. They have been great influences in my life always being there for me know matter what. To spend more time together and create the memories so when you grow up you always have them to remember and can pass them down to your own children. Also, so you can be a better person to yourself and value yourself more. My grandparents used to have us grandkids stay with them part of the summer. We learned about hard work, and ate a lot of great food! I love them so much, and I’m glad that I have so many wonderful memories! My grandparents took care of me a lot before my dad and mom were married. My biological father and my mom split when I was one. He never wanted anything to do with me, so we moved to a house next door to my grandparents in another town. They watched me while my mom worked hard. They gave up their time for us! Even after mom and Dad were married, they would still come get me to go to church with them even though we all went to the same place. It was just something we did. What a fun story! And yet again another reason to value our grandparents. Thanks for sharing! My mom instilled the love of God in me. She was taken from this world way too soon, but now I try to instill God’s love into my own children/grandchildren. My grandparents influenced me by their faith and their church attendance. We only went to church when living with or visiting them. My gramma had a big influence on me. I stayed with her while my mom worked during the week. She fixed me butter and lettus sandwiches and root beer floats, and she took in stray cats. My parents always had so much love for their family – always had the time, loads of faith, and made many memories with/for us! My grandmother was more of a mother to me and my brothers. She taught us so much about love and being a family and really kept my family together on my dad’s side. She also taught us a lot about God , she was very religious and although she is gone from this world I know she is in heaven and watching over us. I spent the majority of my childhood with my maternal grandmother. We baked on Saturdays, went shopping and worked in the garden. Those were good memories. They gave me a lot of attention and love. Both my grandparents and my parents raised me to be a good Christian woman with morals and values. That is unfortunately rare now-a-days. My grandparents had a huge influence on my life…my Grandpa loved me unconditionally and did everything he could to help me in anything I wanted….he could also fix ANYTHING broken including my heart! I miss him everyday! One set of my grandparents absolutely loved their 21 grandchildren and created a fun and loving home and yard to visit. My other grandparents were strict and hard working. Both sets were loving and taught many different values which helped created the person I am today. Thanks for the chance to know you a bit more and win a sweet prize. My grandparents are my heroes. They taught me many aspects of life that have shaped my character and made me the person I am today. Now that they’re gone, I still find my thoughts turning to them as I teach my children something that they taught me, or experience something that I learned from them. My Grandparents and my parents have always worked very hard and had a good work ethic. Grandmothers are so full of wisdom and knowledge – I hope I am that kind of grandmother too! My maternal grandparents were the only ones I was blessed to have in my life and they left such a positive influence on me for too many reasons to list. They were just average people born, raised and living in the South during some of the most controversial times in history, yet they taught me to never judge a person by the color of their skin, their station in life, or the things they owned. If I could only be half the person my grandparents were I would be a welcome addition to society. oh, they’ve all been extremely influential in my life. i love them all dearly, talk to my mother daily, and know that they’ve all helped shape the person i am…. My grandparents have influenced me by teaching me about hard work and doing my best but also and most importantly they’ve all influenced me and taught me a lot in faith and living a Christian life! I love Amish stories, thanks for the opportunity. We lived with my grandparents for a short time when I was young and watching them have personal time together every morning was very influential in my life. My parents took me to church and they lived out their faith. My mom and dad always stressed to me that you should always work things out between yourself and your spouse. Don’t go to sleep angry at each other. Work it out first. My grandmother taught me the value of unconditional love; a haven when my teenaged angst spilled out. Also she taught me the value of a public face, of being polite and asking questions of all you meet whatever your mood and whatever their station in life. I was only able to meet my fraternal grandparents but I hold the dearest memories of them in my heart. My grandmother loved having her grandchildren with her. She was in ill health for many years but she gave her time to just making each one of us feel special. I try to carry on that feeling to my grandchildren so they know that no matter what they are special to me. My maternal grandma had a great influence on me. She was a kind & gentle grandma that tried to make sure each of us knew the Lord & knew her love for us. She always used to say to me, “love you, think you’re pretty!”. My parents had a great influence on me. My father was a pastor. My mother used to quote lots of verses to me and instilled in me godly character. I am so grateful for my parents and my godly heritage. My grandfather was also a pastor. My parents were the biggest influence on me and my walk with Christ. I have always known that they LOVED Jesus and wanted to follow them in that. They have also always served others. That’s something I will never forget. I love this Scavenger Hunt!! I am enjoying all of the stories about the authors and the books but my heart is so attached to Amish fiction and non-fiction! Suzanne, I usually read your guest spots on Sherry Gore’s site and Facebook page. You are a phenomenal writer! My parents taught us the value of hard work and to always be respectful and honest. My parents set a good example to us kids in their 50 years of marriage and still going strong! They have influenced me in their walk with the Lord. When ever we would ask dad if we were going to church his answer was , have you ever known me to stay home from church ? As long as the church doors were open we went to church. Great family legacy! I enjoy reading other people’s heritages/history! THANKS for a nice giveaway! My grandparents helped me learn how important a relationship with Jesus was. To be faithful & trust him. My grandparents showed my love beyond measure. I could always count on them for anything… except spiritual guidance. I grew up in a family that belived in God but that was as far as it went. I had to find God on my own and I have never looked back. He is my strength and my source of hope. My husband’s grandmother had a huge influence on me. She passed away this year. She was the sweetest lady, with the heart of a true servant. She taught me how to live! My grandma has had and continues to have a huge influence on me. There’s a joke in my family that my grandma’s genes all passed to me because we are so alike. You can tell it runs in our blood. Except my mom was adopted so we are not related by blood at all! It’s crazy how much like my grandma I am though – my mindset towards life, my hobbies and interests. She takes full credit for my being a devouring reader – says it’s because when I was a baby she’d read to me constantly. 🙂 I have ways I’m like my mom too, but even more like my Grandma! My grandparents were/are an amazing example of Christian love and hospitality. They also pray for all of their kids and grandkids, great-grandkids daily, what a blessing! My parents have taught me what it looks like to live for Christ. Interesting question..what influence my parents and grandparents had on me. My answer is more the opposite, I came to learn to forgive because of the influence they had in my life. We all do the best we can with what we have. Our lives are combinations of the influence of our environment and what we come to accept as normal in how we were raised. Somewhere along the way we grow. My mom gave me my love of reading, books, words, and all things related. She would have loved these scavenger hunts. Both my parents have been a huge godly influence in my life. My mom led me to Christ when I was 8 and my dad has always been the mature spiritual leader of my family. I am extremely thankful for both of them. My grandma was sweet, selfless, funny, adventurous, giving, beautiful, and kind. She was the most Christ like person I have ever met. She is who I strive to be more like, she Is my hero. I miss her ever day! My grandparents shared their love of reading and music with me, which are very much a part of my life now. My grandmother lived with us for several years, and instilled in me a love of reading. I’ve pretty much stopped reading Amish books, but I loved the first book in your series and I do so want to finish the rest of the series! My parents taught me the meaning of hardwork and meaning what you say. They also raised me in church. My grandparents showed me what true dedication was. When my grandma was sick with dementia, my grandpa took care of her until it was physically taking atoll on him and he had to place her in an assisted living home, where he faithfully visited her. He still tells their story and is always hanging new pictures of them, even four years after her death. My grandpa was a faithful man. My grandparents taught me that you don’t have to have a lot of stuff to be happy . Oh, my goodness. They showed me the value of hard work, the strength of true love, and the rewards of serving God with their lives. Did not really get to know my grandparents which makes me very sad. Would love to win a good read book. My mom was a wonderful influence on me. She was a single parent raising two girls, but always had time for us. I never was really around any of my grandparents. Thanks for a chance to win! Mother instilled a love of God and missions. My grandparents were such an wonderful influence on me. The decication to family and friends. I also learned to can, garden and bake from them. influence still plays a major influence on my life. Outside of the Lord, my parents have certainly had THE biggest influence on my life. I am so blessed and grateful that they are strong Christian who love, encourage and support me in so many ways. My parents have greatly influenced my life. They have always encouraged me and acted as great role models. All of your books look good. Nice to hear about your grandmother. Have been following you on facebook for a while. Wow! I love chocolate chip cookies. Thank you Ruth Wakefield! That meant to say knew. They showed me how to genuinely love another person. My grandparents influenced me the most by their Christian walk. I remember hearing my grandmother sing hymns as she worked around the house. My grandfather never used strong language – even when he was REALLY angry. Their house was always open to anyone who needed a bed for the night (or a couple of days) and we could always squeeze one more around the table at dinner time. I grew up not knowing either of my grandmothers so I am trying to be the best grandmother I can to my 1 yr. old granddaughter. Whether good or bad I think all our parents and grandparents affect us somehow. My grandma especially was the strongest influence in my spiritual walk. Some of my best childhood memories are from spending weekends on their farm, being the only kid instead just one of five! Going to church on Sunday mornings & wonderful afternoon meals…it was the best!!! My mother-in-law made a huge impact on me. She was an amazing mom and grandma. I had no doubt that she loved me! I want to be like her! Loved the story about the first chocolate chip cookie! My mom’s mom died when she was 24 so I never met her but she must have been something! She was a little Swedish Grandma! She must have been a coffee drinker because she passed that on to her girls! I can’t wait to meet her in heaven! My Dad’s mom was also Swedish and was very sweet but she must have had a lot of inner strength. She was a farmer’s wife with 5 very rambuncious kids (2 boys/3 girls). She loved Jesus and loved me. I found a sweet birthday card and letter she wrote me a few years ago that I just cherish. We didn’t live close like the rest of the family so I only saw her 6 or maybe 7 times but I loved her so. I learned from my grandparents how to be a good loving Christian grandmother, and also from my mother, to love and give my heart to GOD, be a kind and loving person, and how to make do with little. My dad taught me that when you do something to always do it right. Not to do a so-so job. He was a well respected Carpenter. People wanted him to do things for them even after he retired. I learned the lesson and used it with my sewing. My grandmother was the first one on my side of the family to become a Christian and because of her I was blessed with Godly parents that my children are still learning from every day. They have all been huge influences on our lives and I hope I can turn out to be as good of an example to my children and grandchildren as they continue to be. That is the second time I had this happen. It said I commented when I did not. I just clicked on the box to comment, and did not get a chance to answer the question. I did not know any of my four grandparents, either paternal or maternal, but my parents had a huge influence on me. My Mom was the only one that ever loved me unconditionally, and supported me totally, even though her childhood made it difficult for her to love easily. I REALLY enjoyed Ruth Wakefield’s story, as well as Tricia’s grandmother’s story, and I am going to do reports on both of these women for our Women’s History month unit for our homeschool. I already Liked both pages on Facebook, and I am not on Twitter. I shared a link for this giveaway on Facebook, too. I would be over the moon if I won one of Tricia’s series! My folks were both born in Russia and fled to Canada during Stalin’s time, when the Mennonites were being persecuted. They met some years later and married, having 5 children, of which I am the youngest. My Dad put himself through college and received 2 degrees. My Mom became an RN. All 5 of us have a college education and we are passing along the importance of education to our children. My mother was the best example of what a Christian should be, and I can only hope that my example teaches my daughter as much as Mom’s taught me. Thank you, Betti, for sharing this fascinating history about Russia and the Mennonites. I am definitely going to look into this further. I love learning about new (to me) authors! My parents have influenced me by showing my brothers and I how to be good people and care for each other. Wow love what Suzanne shared! How awesome! Hmmm I would have to say their love for books! My grandparents are gone now, but they they had a big influence on my life in terms of how they raised their children, my parents. My parents and grandparents gave me an example of hard work and a love for the Lord. That is really what it is all about!! My parents and grandparents taught me and modeled for me a hard work ethic. My grandparents were wonderful to know. We went there every week for Sunday dinner and we played in the creek and walked the farm. My granny had me bake cakes and we took them to shut-ins and she taught me to write letters and send notes of encouragement. My parents taught me values of love and concern, and respect for elders. I am so excited that my first grandchild is on the way!!! I want to have a positive influence on them just as mine did on me! Woohoo ! Oh Tricia, i am so enjoying this Hunt, it is so much fun ! Love ya all so much… I have fond memories of my grandmother Fisher and Grandfather too. It has shaped me into the country loving farmgirl I am. My parents are the big reason why , despite many health issues, I have a wonderful life. They taught me that God always does what is best for us, and that life is what you make it no matter what the circumstances. I only had one grandmother that I knew. She lived with us for awhile. She always treated my sister and I so specially. She loved puzzles and games and that is where I got my love for both. One of my earliest memories is my grandfather’s “sayings,” like “It’ll feel better when it quits hurtin'” and “Just keep flying straight ahead.” He’s been gone for quite a few years now, but I still find myself quoting him sometimes! My grandparents were my heroes and role models when I was growing up! They took me to church with them every Sunday morning when my mom was working nightshift and couldn’t get me there!!! There is one other story I love! She was in labor with my grandpa, but “the doctor had to eat before he delivered the baby!” So while in labor she cooked the man dinner and he had to “hurry up and finish so he could deliver the baby.”! Even though she was this tough she still had one of the biggest hearts full of love I’ve ever known!!! There are many more stories and memories I have of her but I think I’ve shared a lot already. Ohhhhh, my grandparents. Sniff. I miss them so very much and can’t wait to see them in heaven! They were both wonderful people who instilled in me the principles of laughter, sobriety in spirit, learning and being brave. They toughed it out through the good and bad, loved each other through their faults, and impacted those lives that were blessed enough to have come into contact with them. Love you, Grandma and Grandpa! I’ve been blessed to have a great relationship with my grandparents. So grateful for that. My parents were and are great influences for me. They took me to church and raised me in a christian home that introduced me to Jesus!! My grandmother was a major influence in my life. She was the stabilizing force that held our dysfunctional family together. She passed away in 2007 and I miss her more every day. My family has been a HUGE influence in my life. My daughter is named after my Grandfather even. My husband and I were married on both my Grandparents and my parents anniversaries. Our relationship led me to follow Christ instead of the world. You are high on my listen list. Great post! Your name appears frequently with several of my Facebook author favorites. It was so much fun reading about your grandmother! This is one of the things I love about these hunts! Thank you for sharing and being a part of the Hunt! I loved reading about the influence of grandparents.My grandmothers were both Sunday school teachers and had a great influence in my Christian life. I couldn’t even begin to tell you the influence my parents and grandparents had on me, but one way my grandmothers and mom have influenced me is by their demonstration of being voracious readers. My grandparents and parents also gave me a long legacy of Godly heritage – that’s probably the hugest impact they had on me. Thanks for this giveaway! What would we do today without chocolate chip cookies??? It is hard to say how my parents and grandparents influenced me. I am a Christian because of them, they taught me my values and the Bible Way. Thanks for being a part of this scavenger hunt! What a great story! I have been very blessed to have all but one grandparent still with us! I will always remember my grandfather who has passed telling me I was a pretty girl, which meant a lot, and being a spiritual leader and encourager. He taught me how to bait a minnow at the lake, something I’ll never forget even though I was very young. My other grandfather is a precious man, gentle and loving, and always stands for what is right. He always has a hug, smile, and kiss for me. My grandmother is hard working, very generous, and basically knows how to cook anything without a recipe…and it’s always delicious! She even came to visit us by herself so she could show me how to make some jelly…with wild grapes she picked in her back yard! : ) I could go on and on….I’m so blessed by all of my grandparents and appreciate the legacy of faith in Christ that they have modeled for me and my family. my grandparents have influenced me by showing me to hold on to what is dear in your life…Its what i am doing now, even though it doesn’t seem to be happening the way i would have hoped it would. They left all of us grandkids some land that they had. Me, my brother and sister are trying to hold on to it and move out there. Seems every way we turn that something else comes up where it seems impossible to move out there. But with the Lords help, we are going to be out there!!!!! My grandparents helped me in just being myself. My parents are totally opposite of them. They want me to be more like their friends’ children. Somewhere I find a balance even though my parents are pushing their idealism on me. My grandmother more than any other grandparent taught me the importance of doing an honest hard day’s work and the reward will be there in the end no matter what the job is. If you are offered $2.00 or $10.00 to do that job you agreed to do the job for that pay and should do it to the best of your ability. You should not worry about who is not doing their job, just do your own job and you will be rewarded. Sometimes the reward is just going home knowing you did a great job at work. I’ll think of your story every time I eat a chocolate chip cookie! I also look forward to reading your books. My parents’ greatest gift to me, throughout my upbringing was to teach and encourage my faith in Jesus Christ! My grandma liked to bake and when my kids were little I used to bake for them a lot, She also did a lot of needle work, tatting, crocheting, embroidery, quilting, etc. I have done all of these but would love to spend some time learning to tat better, I have done very little of that and I think it is a lost art. I spent most of my growing up years about 10 (sometimes more) miles away from my maternal grandparents. We didn’t get to see them everyday, but we got to see them quite often. They are always busy, and my grandma likes to craft. Must’ve rubbed off, because my mom and I really enjoy crafting too. 🙂 A few months before we moved five years ago (and right on my 18th birthday), my mom and I had started visiting her every Wednesday, and we’d sew (sometimes I would bead jewelry) and talk. I miss that, but it’s nice to know we can still go visit when we can. My Grandma Honey taught me how to bake and crochet. I am thankful for her being there always. We picked veggies from the garden and canned or freezed the food for the winter. I enjoyed being with her and my mom. I miss them both. Loved my grandparents….they were wonderful people!!! My grandparents and parents were devout Christians and taught me that God is the most important person in my life! My grandmother was a teacher of 5th grade girls sunday school for over 50 years. I was so blessed that I remember how she wanted to encourage them and influence them to follow Christ, as well as her grandchildren. My grandmother and I were born on the same day, 77 years apart. She greatly influenced how I’ve chosen to live my life. She nurtured my love of books. I would not be the person I am today had I not had her in my life. Even though she has been gone ten years, I continue to try to make her proud. My grandma was not a christian but she let my mom go to church. My mom became a christian. She always took my sister and I to church and we both became christians and love the Lord. When my mom died I took my grandma into our home. She kept hearing about Jesus from our family. The day before she died she accepted the Lord as her Savior. My parents and my grandparents as well were always such wonderful examples for me as I was brought up in church and we all attended together. My grandmother has had a tremendous influence on me. She is at the end of her earthly days and it is is painful to know that she will soon depart for heaven. I try to take comfort in the fact that I will see her again, but selfishly I never want her to die. She is an important part of my life and I will miss her dearly. Her strong spirit and ability to make me laugh are things that I love about her. Your grandmother sounds like a truly great lady. Part of me wishes i could be bold enough to put certain princesses in my life to work cutting tomatoes. LOL Thanks for the chance to win! My parents and grandparents have been a huge influence on my life and values, especially with their example of service in the church and community. My grandparents influenced me by sharing their love of the outdoors. My first camping trip with with grandma and grandpa. Their love of the Lord is also the strong legacy that has followed me throughout my life. My grandmother always had time to share love with me. I hope I am as great an influence on my own children and grandchildren! I only had one grandparent still alive when I was born, so my parents were much more influential in my life. They taught me about hardwork and trusting in God. My grandmother, while she did love me, was very worldly and was more of an example of what a life of excess looked like. I LOVE that my son has all his grandparents and that they are all Christians! My grandmother has taught me to always trust in God and that age is just a number. She is 94 and still active and tries to stay young. Also she never thought she would be married with kids and I have also felt this way but she continues to encourage me that I will find Mr. Right one day! I didn’t know my grandparents as they were gone by early childhood. I have tried to be a big influence on my grandchildren because I realize I missed much. Thanks for the chance to win these great books! God bless you! Loved your story about the 1st chocolate chip cookies! I will be adding your books to my list. I used to love cooking with my grandma 🙂 and spending time with her! I miss my grandma…wish I knew my others better…they died when I was younger…but my Gram…she was a hoot! From cooking to sewing to Jesus, my grandparents, now in Heaven, are still a sweet influence in my life. My parents were the hardest working people I have ever known! They started out with a few acres to farm and raise animals and kids on. Had to carry all the water to the house from the pump down by the barn because the pump close to the house always ran dry. No indoor plumbing. But they built that farm up to a lot of acres, which are rented out now to neighbors. They worked so very hard! I am so lazy, compared to them! My parents gave each of us kids (I have an older sister and 2 younger brothers) the gift of their presence in activities at home at at school and church. We never questioned going to church on Sunday. We never questioned that “Jesus Loves Me” and was there for us no matter what we did, because we felt that strong love reflected in our parents’. My grandparents were great people and took me in for a short time when trouble was going on at home. I didn’t know my grandparents well, but they didn’t have much in the way of worldly possessions. They were farmers, worked hard the entire lives and taught my mom to be super resourceful and independent. My grandmother , who lived just a few houses from us, was a very good influence on my life. After leaving an abusive marriage, she had very little, but was always sharing! Every kid in our small town knew that there were always cookies in her cookie jar & that she loved everyone of them. My grandmother was a very outspoken woman and very lovely woman. Her saying was “Pretty is as Pretty does.” This meaning if you do good, you will look pretty in all ways. She is in my special memories. I would love to win these new books. I enjoy reading your books. My parents and grandparents we Christians, which definitely influenced the was I grew up, and they inspire me to try to be a better person. My parents lived a godly life that was always centered on Christ. An amazing example to me. I miss them! My grandmother and mother taught me how to bake and entertain (as one of my friends said, he knew I was PA Dutch the first time I showed up for a casual visit with homemade food), and my parents taught me the habit of going ot church every week, so that now I truly look forward to it. Both my paternal and maternal grandmothers were a big influence on me as a child. I lost track of my paternal grandmother back in the mid ’50’s but was able to keep up with my maternal grandmother until she passed away in the early ’80’s. This book series looks like an interesting read. My grandparents taught me the value of family. I grew up with both sets of grandparents in the same city as me and they were a constant in my childhood. They all held different values but I knew that they loved me and that family was bigger than all the different opinions we might hold. What an awesome story! Grandmothers offer so much! What a great question. Both of my Grandpaw’s passed away before I was born, but the legacy’s they both left were great. My Grandmaw Cox helped to raise me due to parents divorcing when I was around 2 yrs old. I would have to say she was the biggest influence in my life. Her first love was family, God, myself and church then friends. And yes I know most say put God first, but Grandma taught me that if you love and take care of the family that God placed you with then He in return honor my prayers for them. He is the one that I know with out a shadow of a doubt did this for her. My Grandma Muncey was not a christian but she also taught me to be ME and to not let others change who God meant for me to be. She like I said did not profess to being a christian (she gave her life to him before she died) but there was still the life lessons. Thanks for participating in the Scavenger Hunt! My grandmother was to me the dearest person on the planet. She was love. She was home. She was faith. I can only hope to be a portion of that to my granddaughter. My parents have taught me the ways of the Lord. I did not interact much with my actual grandparents. But my great aunt and great uncle filled that void. Lu and Rudy gave me a great example that I continue to lean on for living a full life without having children of our own. I’m not sure how they actually did it, but they were both fun while still instilling a sense of awe and respect in us. I treasure my memories of them both. My parents continue to influence me every day. I value their opinions and enjoy getting to know them better all the time. Well, I am who I am on account of who my parents and grandparents were (one still is). I love to read because of my parents! I miss my grandmother so much she always helped me with anything I needed and taught me a lot. My grandmother influenced me by showing me how to live a life that looks like Christ. I miss her so much. My grandmother taught me to cook. 🙂 She also taught me so much about etiquette and being a lady. My parents have taught me what a good marriage looks like, how to love God, and how to work hard to reach my goals. My parents & grandparents are such huge influences to me. Everything I aspire to be as a parent, I compare to their example. I research everything, always being educated, because of my dad’s influence. I throw myself into my work because of my grandfather. I try to make my daughter’s life full of full events because of the full life my mother gave me. I’m very blessed. My parents are wonderful and I’m so thankful that they instilled a strong work ethic in me, while also being loving and supportive. They also encouraged education, which I think goes hand in hand with my love of reading. Thank you for this opportunity! My grandma always baked with us and made sure we acted like good people! My parents are the best and still instill in me the importance of God and being the best person that God wants me to be! My grandparents have influenced me by living godly lives. In addition, they claim everyone as “family.” I think our family has doubled in size with all the “adopted” aunts, uncles, cousins, sisters, brothers, etc. My grandparents truly open their arms and their home and welcome everyone in. I am blessed to still be able enjoy my maternal grandparents and their wonderful influence in my life, as well as in the lives of my three children! My grandparents have all been gone for a long time but they were all loving people and left me with many memories. Amish lifestyle and theology intrigue me. I don’t believe I could give up all my freedoms in Christ to convert to their lifestyle. Thanks for the story about the first chocolate chip cookie. Love it. My parents modeled a loving and lasting marriage before me. They also taught me what love for our country means. That led me to join the Air Force where I met my wonderful husband of 35 years. I’d love to win a copy of your book. Okay, so I didn’t read what we were supposed to be commenting. My parents inspired me to work hard, and my mom encouraged me to enjoy cooking, especially baking (which I plan to do in a little bit). My grandfathers were not alive when I was born. My paternal grandmother taught me kindness and serving others. Later in life, I learned that her parents didn’t want her and grandpa to get married. They were really nasty and vindictive about it and there were several years where she did not speak with her family. But when her mother died, she took her father in. They could not own carpeting because he chewed and spit tobacco and would miss the spittoon. My grandmother was bound and determined to let her children marry who they wished, whether she was personally comfortable with it or not. She was very nervous about the length of time that my parents courted before marriage (6 months). She did share this, but was always kind to my mom and had a good relationship with my dad. My mom did not like who I dated and the man that I dated 8 years before we got married, with a two year engagement. She was horrible and made nasty comments at our reception even. Then after our marriage she ignored my husband at get-togethers. She would not put a photo of the two of us up, despite her having them. She had many wedding pictures that we shared, yet the only one she put out was my brother and I dancing. We were terribly frightened when we announced after 2 and a half years of marriage, we were expecting for the first time. Surprisingly, she handled it like a grandmother to be should. We do not want our boys around the toxicity in that house to often, but we do want them to have a relationship with their grandparents. We see them 8 times a year, at least. My oldest will ride with them for short trips in the car and still has picked up on the disrespectfulness. When we were over once, my 30 year old brother at that time, (and who still lives at home) had a tantrum because my dad possibly slightly bumped his WII and he had to recalibrate it. His WII is hooked up to their TV in their living room. Anyway, my son did not understand that behavior. So recalibrate it, if even if you have to do it 70*7 times. It is not broken. Anyway, my grandmother is my hero, knowing what she went through. My grandparents have had a huge impact in my life from being an amazing example in everyday life to also passing down to my parents and then to me the importance of having a faith and relationship with God. I spent a great deal of time with my grandparents during the summer. I mowed their lawn every week. Grandma made the best beef and potatoes. To this day I can still taste them. Grandpa was blind for several years and I would read the newspaper or the Bible to him. Thanks for your part in this contest. They were a huge influence in my life.. I wouldn’t be the person I am today if it wasn’t for them. I love the story of the chocolate chip cookie. Thank you for sharing the story. My Mother has been a strong influence in my life. She’s not only done it by teaching but by example. How to treat people and doesn’t matter who they are. Her walk with God, her faith and her complete trust in the Lord has been an awesome blessing. I can remember hearing something at 3:00 am and peek in the living room and my Mom on her knees praying. I’ve been blessed with a wonderful Mother and I thank the Lord everyday for her and I never want to take her for granted. Thank you for having a giveaway. My great grandmother was a huge influence on me. She was a wonderful christian. Her house was filled with family antiques and the smells of homemade bread and cookies. Loved reading your grandmother’s story, & learning about the Toll House! My grandparents all had such strong work ethics, they were all farmers, & I like to think that it was handed down to me! I am already signed up for your blog, newsletter, Facebook, & Pinterst board. I was blessed to be born before my great great grandmother passed. I got to know her, my great grandmother, my grandmother and my mother (who I didn’t grow up with). Something about having five generations of women alive at one time really sunk deep into my life that every day counts and that we leave a legacy for our children/grandchildren to follow in. My parents have instilled a love of travelling in me. My mom never travelled as a child but always wanted to. She made sure that my sister and I had that opportunity growing up. Those trips created a lot of family memories, and I treasure the trips my mom and I still take together. I love this story of inspiration about the grandmother…and I liked yours too! My Grandmother was so devoted to her walk with God that I wanted to pattern my life after hers. She was a patient, loving, and kind Grandmother. I miss her so much! My parents and grandparents have taught hard work and honest living, even when others don’t see you do the right thing. I didn’t really know my grandma very well as she had 40 grandchildren. But from my parents I learned treat others well and they will in turn treat you well. Thank you so much for the Scavenger Hunt, they are so much fun. I’d also like to thank you for a chance in your giveaway. My maternal grandfather and my paternal grandmother died before I was born. My mother died when I was five and I did not see her mother, my grandmother, again until I was 17 and visited for an afternoon from out of state. My paternal grandfather died shortly after my mother. My father remarried when I was nine and moved to the middle of the Ozarks on a farm from my fourth to sixth grade when there was a drought and we moved from the farm. Today, my husband and I live in the Ozarks, where we moved to retire. So my heritage would be these wonderful people we live with in our community and church. Spent most of my childhood with my Grandparents and miss them both very much! Thanks for sharing and this chance to win! Blessings to you and your writing! My Mamaw is more like my Mom. She has always been there for me, when no one else was. She has thought me how to cook, can foods, keep house and most important she took me to church. She is 83-years-old now and has cancer, I know my time with her is limited, that’s why I cherish every moment I have had with her and continue to make new memories. My grandparents taught be that you can be happy living a simple life. The difference between wants and needs. Great life lessons. My Grandmother used to take me to church camp every summer. She was the first to introduce church as being something I enjoyed. My grandmother raised me day to day as my mother worked… I knew Jesus from as long as I can remember… did church and still do, but denominations were never the important thing.. Knowing Jesus was. To answer the question about the influence of parents and grandparents, first of all, my family came to America after having fled from East Germany during the time of the Communist rule. By so doing, all relatives were left behind in Germany. My family was the only ones that left. So therefore, influence of grandparents was only through letters, which at that time was really the only type of communication. No emails, texts or Skype…but there letters were always kind and encouraging throughout my life. And as a result, as a grandparent, myself, I try to play an important role in the lives of my little grands! So that being said, my parents, of course, had a great influence on me. They taught me about faith in God, Jesus and about trying to live a good Christian life. I think they did a good job. They are still close to me and live on the same street and when I have a problem, even at my age, I go to see what mom and dad have to say about it! My parents was a fantastic influence in my We were brought up in a loving solid family true values of life.Sent us to a catholic school Always supporting us in everything we did. and always lending a hand when needed. My parents influenced us in the way that they were always available to help someone in need with little thought to their own comforts. They taught us to be giving of ourselves to others and I hope that I can influence my own children in this selflessness that is very rare these days in a world that’s all about “me”. So thankful for Jesus and the influence of Him in my life…for He is the greatest example to follow. My grandmother always taught me to pray and never ever think I am more important than God. Through her I learned God, faith and family are the most important things. Thank you so much for the contest, I can’t wait to read your books. Thank you Tricia for sharing about the invention of chocolate chip cookies. My grandma taught me to stay close to your family. We would always be together every year at Thanksgiving. My mom taught me to treat others the way you want to be treated. All of my grandparents and my parents were Mennonite and they instilled in me the value of hard-work and helping those in need. They also instilled in me the need to spend time with fellow believers whether in church, Sunday school, or in times of fellowship. What a great story. My mother was a great influence in my life. To sacrifice your selves for others and to be kind and help others when you can. My grandparents have been gone for a long time but the memories I have are so precious. I learned a lot from my Great Grandma. She died a little over a year ago at the age of almost-94. She was an amazing woman, raising 2 kids alone, outliving 2 husbands, and spending the last 33 years a widow living in her own home until the last few months. I loved my Great Grandma and I still miss her dreadfully. She was part of the inspiration for my quilting attempts. She always encouraged my craft-work and would add to my supplies when she could with her limited finances. She gave me things like sugar and flour for my Birthday and Christmas when I was a child because she knew I loved to bake. I miss you Great Grandma. I didn’t and don’t know my Dad’s family because they live too far away and they just didn’t approve of Christianity and homeschooling. But I do know my Mom’s parents. Grandpa is one amazing guy, so full of love for his family. He is an inspiration for loving your family because they are family. And family is what matters most. Grandma is a little different, not exactly gentle and soft but still a very special woman. She is the other inspiration for my quilting attempts. She answers my quilting and sewing questions and even stayed up late last year to finish my crinoline (for a 1950’s dress) so I could wear it to an event. My parents and grandparents have everything to do with my faith in Christ. The best gift they could have given me. I have not read any of your books so look forward to them! My grandparents and parents were all godly examples to lead me to Christ. That is the best thing they could have ever done for me. My parents brought me up to high moral standards as a Christian. My grandparents also went to the same church and their Christian lives were a big influence on me as well. My grandparents (maternal) were substitute parents. I had a bad home life and my grandparents were my sane, safe spot. I do not think I would be here, and be sane if God hadn’t placed them in my life. My grandparents (on my mom’s side) made me feel like a valued and special human being. They took an interest in me and made sure I knew I was loved by them. If it weren’t for them planting the seeds that I was someone special, the rest of my life at home would have been unbearable and I know I wouldn’t be the person I am today without them. I was blessed to have had Grandaddy for 27 years of my life and my Grandma for 30. My Moma took me to church even when we had to walk. She taught me about love even through several abusive situations. My granddaddy gave me a dime to get fudgsicles at the corner store. Whoops, now my answer. My grandfather was a physically strong man. He was also very quiet. He taught me that no matter what, you never give up. OOOps! In my excitement I forgot to answer the question… I didn’t know my grandparents so I have a burning desire to learn about where they lived and what it might have been like during their life. My parents had a huge influence in my life. My parents are the ones that led me to Christ and taught me what it truly means to be a believer. They were quite the example giving up the “American Dream” to head to Russia to be missionaries when they were in their 40’s. So thankful for their godly example in my life. Would love to win some books. I didn’t know my grandparents very well. they lived so far away and died when I was quite young. (I’m glad my children were able to know their grandparents much better than I was). My father was a faithful minister of the Gospel and my mother a very Godly woman, so they had a great influence on my life and I am so thankful for their testimony in my life. Thanks for the chance to share a little of my story. They taught me the value of hard work and the importance of family! Looking forward to reading some of your books! My parents placed in me a great desire to read…we had books all over the house!! I remember going to the library on my Schwinn bike each week, checking out 7 books (the limit per week), reading them all in a few days, but having to wait till the next Sunday to get more books! What a great story about your grandmother, Suzanne! My grandparents have left an legacy of love to our family, and my grandmother and I, in particular, both LOVE to craft! Thanks for participating in the scavenger hunt. I’m thankful that both my grandparents and my parents are believers and even now, my mom and dad are still setting an example of how to walk with the Lord. We’re blessed also that we live close by enough that my kids can get to know them too! My grandparents instilled work ethics, self sufficiency, love and faith. One of my grandmothers also shared her love of reading with me. Every book I read I think of her and how much she enjoyed the books she read. I loved “The Letters” and enjoyed reading about Suzanne’s inspiration for the bed & breakfast. And the first Toll House cookie . . . little gems like this make reading so pleasurable. My grandmother lived with us when I was growing up. She wasn’t a fancy cook, just good north Georgia mountain style of cooking that was delicious. She rarely followed a recipe and when I questioned her, it was always, “Just a little of this…if it’s too thick, do this,” etc. But when I got married, she presented me with a hand-written notebook of her favorite recipes, which I still use and treasure today. Both my mother and her mother were driving forces in all that I have done in my life. My mother pushed me to do the best I could do, and my grandmother was there to cheer me on. It’s been a hard thirteen years since my grandmother passed away…I would have loved for her to see how her great grandchildren have grown up and how us grandkids have aged. I miss her more and more each day. My grandparents and parents introduced me to Jesus as my Savior and loved me and prayed for me. I am very thankful for each one. My parents have always been there for me. Thanks for the great giveaway opportunity. My grandparents lived thru the depression, so they were very, very conservative and lived a simple life. She made cookies with simple ingredients. We only had molasses, roll-out cookies or peanut butter. She always conserved paper, she kept envelopes and little pieces of paper to write on. There house was very functional. They didn’t have matching pieces of furniture or things in the room just for looks. There are many Amish people near my parents’ home, and my great-grandparents were Mennonites (my Grandma was until she married my Grandpa). I am interested in learning more about their way of life. I love the simplicity. Thanks for the awesome giveaway Tricia and I also enjoyed doing the hunt! My grandparents loved to read and their house was full of books. My mom inherited that love and past it on to me. Thanks for the great giveaway! My grandparents taught me to love all people, regardless of what society believed. They taught me there is good in all people, you just have to get to know them well enough to help them show it. I spent summers growing up with my father’s parents. Learned to love the countryside and reading. Thanks for the giveaway. Oh, just saw what I was supposed to be commenting about…whoops! My grandfather just turned 80 a week ago. His musical abilities (he plays guitar, fiddle, banjo, mandolin and sings all without reading a note of music!) amazing and encourages me to learn more. I have loved singing with my Grandpa since I was very very small. My nana had a big influence she used to take care of me most weekends and told me the stories of her childhood in Scotland, she was an amazing lady! My parents have had a great influence on me. My dad has been an influence about education. He has always encouraged us to study first and get an education then everything else will fall into place. My mom has had the greatest influence on me. She’s such a caring person and so kind to others. She has shown us to be respectful toward other people and just shown us to be appreciative of what we have. I’m so thankful that my mother showed us not to be judgmental towards other because of the way they look or behave but on the contrary be kind to them. My mother lost her father in an accident before she was born. Another accident claimed my grandmother when my mother was 7 years old. Her aunt stepped in to raise, not only my mother, but my uncle and two aunts. This woman became my grandmother and taught me so much about faith and strength without saying much at all. What a great backstory! I have heard the story before, but to have a connection with an author of books…how cool is that! My father’s mother raised me and instilled Southern mannerisms in me. She was my best friend until she passed away when I was 19 years old. I love these scavenger hunts! I learn about so many authors that I haven’t read before! I am always nervous to try a new author but this really helps you get to know them and their writing style! My grandparents have had a hug impact on my life. I only had one set that I knew. My Grandpa passed away about 5 1/2 years ago.He always had words of wisdom, but he was also very funny! I loved spending time with him. My grandparents left a legacy of love and faithfulness. My grandparents really valued family and worked hard to keep all those ties open. Due to their work, I have a very loving extended family in my life. My parents left me a legacy of love and of creativity. My grandparents and parents have a huge impact on me. They have taught me so many things and always want the best for me, no matter where it may take me. one of my grandmothers took me to church when I was growing up. She also taught me the importance of prayer. I wish I’d paid more attention and learned even more from her! My grandmother left me with remembering laughter. I remember laughing a lot with her. I never knew my grandfathers. My grandparents, especially my grandmother, had a huge influence on my life. One thing that I learned in particular was to not complain about things I couldn’t change and to enjoy my life no matter the hardships. Another thing I learned that has helped me as I became older was how to be a loving and caring grandparent. My father instilled in me a strong work-ethic. From my mother I found my spiritual path as a follower of Jesus Christ. Your books look wonderful I live near several Amish communities. My mother and I share Amish books and others. I think she would also love your books. My parents and grandparents have made me who I am today. I come from a line of women who are good in the kitchen and love to sew and do crafty things and it’s passed on to me. I love the heritage I have in my family. I was raised in an only nominally Christian home, but one thing I did get from my parents was a commitment to marriage as being a permanent commitment. I am a big fan of Suzanne’s work. Thanks for the wonderful blog! My Grandma, Marie, taught me her wonderful cooking skills-she was full Italian-came here when she was only 10-lived till she was 96! But from Gram K, I learned her quiet strength as she suffered so very much in her last months of life. She was only 72, but was dying of COPD and emphysema and it was a very painful ending for her. 🙁 I sat with her many, many times when she was in the nursing home. I would just hold her hand and pray for her, talk to her, tell her what the kids were all doing. She would just tap her hand against the bed rail and the sound of a big silver ring she always wore, would just echo in the room-clang, clang, clang-over and over. It was the only way she could comfort herself from the pain till her meds would work, when they did. I'll never forget that sound-I still hear it-and I'll never forget her quiet strength as she waited too GI 'Home'. Oh and I have that very special ring now. My Mom, gave it to me after Gram passed because I Shae the love of silver she had. My grandparents influenced me by always serving in their community. My Grandma’s house always smelled like yummy food and was a warm inviting place to go and rest awhile. She created a refuge in her home. She also always had 3 jars of cookies on her counter full for us to eat! They taught me abut love and hospitality and serving others. Would love to read your books. As a grandmother, I am keenly aware of the need to make beautiful memories for my grandies, as I call them. My grandparents have always led by example. Their “lesson” if you will, is to always be of service to others. They always were. I grew up to become a hospice nurse. My grandfather passed away in 2010 and my grandmother just turned 92. I never really knew my dad’s mom very well but my stepmom’s mother will be very much missed. She was a lady who was always cheerful and never complained even though surviving an abusive husband and leaving him during the 60’s had to have been hard. She had a supportive, loving family and I know that really helped – but still even though I didn’t know her during that time the effect that her cheerful attitude had on her family is visible even today. She passed away on June 14th, 2013 and will be very much missed. Unfortunately, not much. My dad was in the Army and we did not see them very often. We did, however, have “adopted” grandparents in many places we went who had a great impact in our lives! My parents had a big influence on me. They loved us kids & spent time with us. They were also a Godly example to us that led to all 4 of their children becoming Christians & living for God. My Grandparents were an example of hard work & diligence. My Grandma loved to do arts & crafts stuff and that has been passed down to many of her grandkids. Thanks for the scavenger hunt fun! I love hearing all the stories and bits of history that you all put into your stories! Thanks so much for sharing! Unfortunately…. my grandparetns passed when I was young… BUT my husbands grandmother was a great woman and taught me how to make pizzelles!!! My grandparents taught me how to live a simple life on the farm and many useful skills, from gardening, caring for animals, to canning and preserving what we produced. My parents were my biggest influence and the greatest influence they had on me was how to raise my children. My brother and I were expected to practice good manners as small children and as we grew up. We were taught to hold doors open for people and to help someone in need anytime would could. I followed in my parents footsteps with my children and the first words my kids learned after “Mommy” and “Daddy” were “thank you” and “please”. They hold doors open for people, help people who need a hand, call when they are going to be late, along with many other things. Too many times, these things are not being taught in the home anymore and unfortunately, in my opinion, it shows in today’s society. The other thing that they influenced me with is to say “I love you” every day to the special people in your life . You never know when you might not be able to give the gift of those three words to someone whom you hold dear. I was blessed with two sets of grandparents who were godly influences in my life. I loved spending time with them and would sometimes spend the weekends at my grandparent’s house with my cousins. My maternal grandma taughts us lots of things….cooking, cleaning, how to laugh when we’re sad, and how to trust God even when it’s hardest. I will never forget the things she taught me. How interesting about the Toll House Crunch cookies and the Nestle connection…I love learning new things!! I always remember my grandpa as a fun, kind, loving and patient man who was pretty darn near perfect. It wasn’t until after he passed that I learned that when he was younger, he struggled with his temper. He had learned to control that part of himself and become the patient, devoted man I remember, inspiring me to continue to work on improving myself as well. My paternal grandparents were not financially well off but I learned humility and service from them. My love of the Amish comes from going to college in the midst of them and then we were the only English in our farming neighborhood. Thanks so much for participating in the giveaway! My dad influenced me to work hard and never give up on a dream. My mom has taught me to love music and teaching. They introduced me to my Savior, as well. Both of their influences have been so beneficial to me! Thanks for being a part of the Scavenger Hunt! It was fun! My parents influenced me by making church attendance every week a priority. They NEVER made plans on Sunday mornings, because we had church. They also made sacrifices so that my brother and I could attend a Christian school. My parents influenced my life in so many ways. They prioritized their lives to put Christ first, family second, and everything else following behind those two things. My husband and I strive to pattern our home “culture” after their example. Thanks for the Scavenger Hunt! My best childhood memories are of me & my grandma. I miss her & it’s been 35 years since she died. Thank you for the Scavenger Hunt. Had a lot of fun.